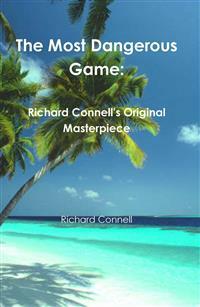 Widely anthologized and the author's bestknown work, "The Most Dangerous Game" features as its main character a big-game hunter from New York, who falls off a yacht and swims to an isolated island in the Caribbean, and is hunted by a Russian aristocrat. The story is an inversion of the big-game hunting safaris in Africa and South America that were fashionable among wealthy Americans in the 1920s. “Yes, even that tough-minded old Swede, who’d go up to the devil himself and ask him for a light. Those fishy blue eyes held a look I never saw there before. All I could get out of him was `This place has an evil name among seafaring men, sir.’ Then he said to me, very gravely, `Don’t you feel anything?’—as if the air about us was actually poisonous. Now, you mustn’t laugh when I tell you this—I did feel something like a sudden chill.